Since its “official” opening on Super Bowl Sunday, January 26, 2003, The Square Grouper Tiki Bar in Jupiter has grown to become one of the most popular watering holes in the United States. It is the home of several music videos, including Alan Jackson’s hit “It’s Five O’clock Somewhere” with Jimmy Buffett. The Square Grouper also hosts numerous fundraisers each year, benefiting many local non-profit and charitable organizations and has helped raise over $500,000 for charity. Live music can be heard six days a week, from fantastic local bands to some of the music industry’s most famous artists. A little piece of paradise, with beautiful water views of the Jupiter Inlet and its famous lighthouse, this local landmark boasts the 19-slip Castaways Marina and the most stunning scenery in the area. Guanabana’s – Jupiter, Florida 960 N. Highway A1A Jupiter, Fl. 561-747-8878 SEE MENU Opened by Jupiter surfers as a sandwich shop in 2004, Guanabanas has grown to become an institution in northern Palm Beach County for three reasons: The lush, tropical setting; great cuisine and cocktails (long gone are the sandwich shop days! 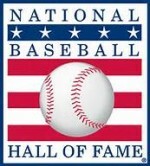 ); and live music from both national acts and the hottest names in South Florida. Guanabanas is a 100 percent open-air waterfront restaurant and bar with woven tiki huts and banyan trees towering over head, and hand-chiseled coquina stone pathways underfoot. The team maintains a laid-back, island atmosphere where everyone is welcome. Jetty’s – Jupiter, Florida 1075 North Highway A1A Jupiter, Florida 561-743-8166 SEE MENU Jetty’s waterfront restaurant has been one of South Florida’s most popular restaurant for 25 years. 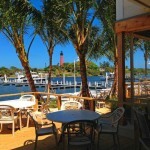 Jetty’s offers unsurpassed views of the Jupiter Inlet Waterway and historic Jupiter Lighthouse. Signature menu items include fresh fish and shellfish, Certified Angus steaks and ribs. 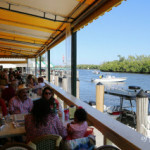 A favorite of tourists and locals alike, Jetty’s offers a true Florida waterfront dining experience. Old Key Lime House – Lantana, Florida 300 East Ocean Avenue Lantana, Florida 561-582-1889 SEE MENU – Florida’s Oldest Waterfront Restaurant! We’re a family-owned and operated establishment that includes a full-service restaurant as well as the best bar in South Florida! Old Key Lime House boasts a breathtaking waterside ambiance with the best view possible of the South Florida Intracoastal Waterway, and the largest Gator viewing site. 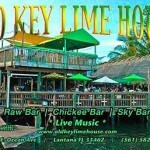 Old Key Lime House has been voted one of the BEST casual party destinations in the area. 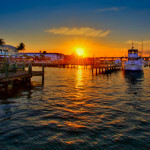 Enjoy the best sunset views in South Florida while dining on delicious fresh seafood and local fare and sipping on cool, refreshing cocktails in an inviting and relaxed atmosphere. We also offer a Kids Zone play area – call for more details. Banana Boat – Boynton Beach, Florida 739 E. Ocean Ave. Boynton Bch. 561-732-9400 SEE MENU Banana Boat has been a landmark “anchor” to the restaurant and nightlife activities in Boynton Beach, FL since 1978. 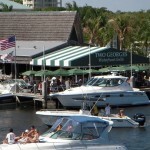 Located on the Intracoastal waterway, Two Georges has been a fixture in Boynton Beach for over 50 years. We are well known for serving the freshest seafood in town. Maryland crab cakes and fresh local fish are the house specialty. 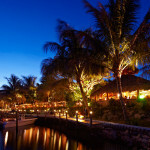 Our thatch roof and island decor will make you feel like your eating in the Keys. Whether you arrive by boat or car you will enjoy quality food in a relaxed atmosphere. If not ready for a full meal, feel free to head over to our patio bar and enjoy a frozen cocktail or cold beer while watching your favorite sporting event on our 20 flat screen TVs. Our local live bands on the weekends is always a crowd favorite. So come on down to THE WORLD FAMOUS TWO GEORGES, kick back, relax, and let our amazing staff take care of the rest!!! Dune Deck – S. Palm Beach, Florida 100 N. Ocean Blvd. 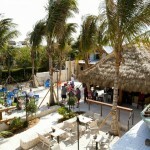 Lantana, Florida 561-582-0472 SEE MENU Enjoy the cool breeze in a casual tropical setting. The DUNE DECK CAFÉ offers a treasure chest of delicious dining combined with Florida’s best scenery. One cannot help but be absorbed in the mise-en-scene palm fronds swaying, sea grapes, multi-colored flowers, and broad sweep of sand and surf of the Atlantic Ocean with it’s balmy breezes that invite you to escape to the Caribbean, the French Riviera or the Greek Isles. 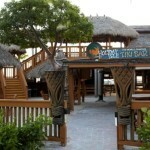 U-Tiki Beach – Jupiter, Florida 1095 N, Highway A1A Jupiter, Fl. 561-406-2210 SEE MENU U-Tiki Beach is located on the Jupiter Inlet, directly across from the beautiful Jupiter Lighthouse. 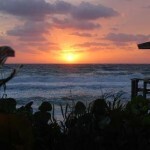 Boasting some of the most picturesque sunsets, U-Tiki is the best place to relax, or entertain special guests! Serving Caribbean food and tropical drinks in a casual, island setting, with deck and beach seating, with gorgeous water views! In an effort to maintain its celebrated island vibe and place in local legend and lore, much of the original Tiki Bar, has been preserved during the renovation, including the signature neon sign and the roof. The original Tiki Bar floorboards, adorning the names of visitors over the past 47 years, were repurposed and used to construct the enhanced bar area. A true Florida Keys classic and home to the original Rum Runner, the Tiki Bar opened in 1969 and quickly became a “must stop” attraction for visitors, locals and wanderers just passing through. In 1972, the hotel’s owner challenged his manager, “Tiki John,” to make a drink out of the overstock liquor in the storeroom. Mixing banana liquor, Meyers rum, brandy and grenadine, the original Rum Runner was born. Located minutes away from Key Largo and a short drive from Fort Lauderdale/Miami and Key West, Postcard Inn Beach Resort & Marina offers quaint ‘boathouse chic’ accommodations. From crisp white bedding and whitewashed bead board to nautical accents and pops of navy, turquoise and sky blue, guest rooms and suites exude fresh island style. The resort offers a myriad of activities including non-motorized water sports ranging from a floating trampoline and paddle boards to peddle boats, bicycles and kayaks. 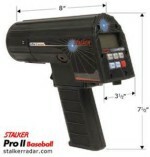 © Keady Baseball . All Rights Reserved.